Canadians are very proud and excited because the 2010 Winter Olympics will be held later this month in Vancouver. Much hope is riding on this Olympics because for some reason, Canadians have never gotten gold medals at the past two Canadian hosted Olympics (Montreal in 1976 and Calgary in 1988). The emblem for this Winter Olympics is that quintessential Inuit symbol, the inukshuk. The inukshuk is a native loose stone sculpture/marker found in our northern regions. Inukshuk means "in the likeness of man". The main purpose of inuksuit (plural) is to guide travelers. They are also used as memorials or to indicate food caches - very important in an unforgiving environment. It is an enduring symbol of survival. When an inukshuk is shaped like a man, it is called an inunnguaq. The inukshuk/inunnguaq logo for the Olympics was given a name -Ilaanaq, the Inuit word for "friend". It's a great choice for Canada will be host to the world - or at least the nations with snow and ice! This is after all the Winter Games. The colors of the symbol celebrates this beautiful country - the blues the sea and sky, the green, forests, the red represents the maple leaf and the yellow, sunrises. How beautiful? Just check out the You Gotta Be Here in 2010 - Super, Natural British Columbia video. And that's just one province. 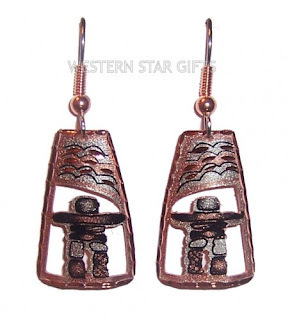 The inukshuk has inspired countless artists and jewelry artisans so here on this post are some of my favorites. You'll notice they are all Canadians! Not only am I looking forward to watching the games, I shall be reminiscing about the time when we lived in Calgary. Not many of you know this but I am a toxicologist who carries out toxin and drug analyses. In 1988, I was privileged to be part of the drug testing team for the Calgary Winter Games - a highlight in my professional scientific career. As I was busy working during the games, the only event we could attend was the opening ceremonies. We were somewhere in the sea of white capes in this stadium shot (picture source). I read and enjoy all of your posts, but this one was particularly educational. Thank you! 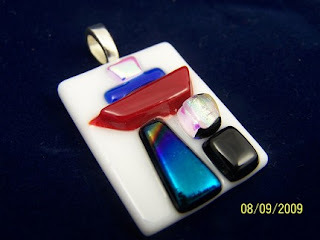 Great jewelry! I live in Vancouver and we are all getting VERY excited about the Olympics. I am planning on taking my 2 preschoolers to watch the torch relay, which comes near our house the day before the Opening Ceremonies. Can't wait! Thanks for sharing this with us. And beautiful jewelry! You got me thinking about what to do with some of my fav stones, collected in places I love. I recently saw a documentation, where an Inuit explains the meaning of inuksuit. Very interesting! What an interesting thing to learn, can't say I've ever heard about what this symbol meant. And the jewelry is just adorable! Good luck to everyone at the Olympics. 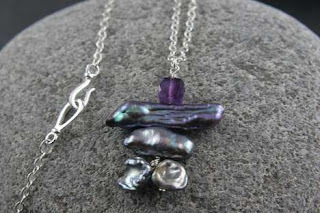 Thank you for the history on the Inukshuk Pearl...I'm a huge fan but never actually took the time to see what they meant!! I've made them from sterling silver using the same principle as the Broken Heart...great fun! For those of you who don't realize it, Tina Holden of Beadcombers', Beach Pebble Inukshuk is actually made of polymer clay. Isn't that Cool! On the Olympic Torch Run... It will actually be going down our street next week. We will get to stand in our own driveway to watch it. Truly a once in a lifetime event! Yes, it is cool! Thanks for pointing that out. 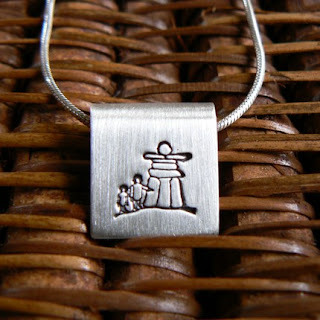 Thank you so much for featuring our Inukshuk jewelry on your blog. I am more excited about the Olympics this year than I have ever been. We had the privilege of seeing the torch go through our hometown a few years ago. It was freezing cold but was well worth the wait!